The Wall Street Journal had an article featuring Madroño Ranch, a 1,500 acre writing retreat filled with bison. 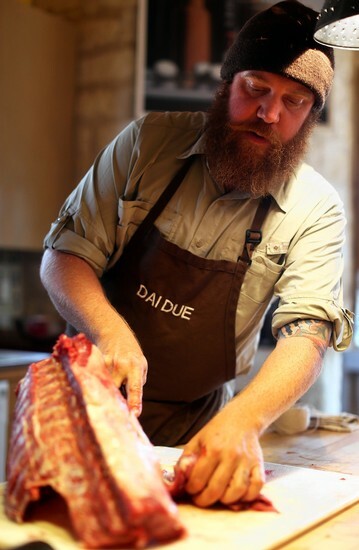 They host regular series of ethical hunting, fishing, and cooking classes by Austin's Dai Due supper club. The one featured in the WSJ was their one on the Feral Hog. The sessions are three days long and are limited to eight guests. Jesse Griffiths literal wrote the book on cooking game and wild fish and leads the class. Sounds like a lecture in delicious after they killed a 50lbs boar. Over the course of an hour, he dismembered the carcass, stopping to explain the uses for each cut. We learned how to wrap the tenderloins in caul fat for a noisette (a small, round piece of meat) and how to roll a porchetta. We moved on to a second hog, which Jesse butchered in all of 45 minutes, and a third he dispensed with even faster.After a break, it was Tabatha's turn to teach sausage-making. She walked us through a Cajun boudin made with rice and the organs, which had been simmering on the stove. I helped feed onions and near-frozen chunks of allspice-spiked boar through the grinder for chaurice, a Creole sausage. In quick succession came a chorizo verde and coriander-and-juniper-seasoned sausage that was bound for the smoker. Their hog school was also featured in an article by Philipp Meyer in Texas Monthly Magazine.